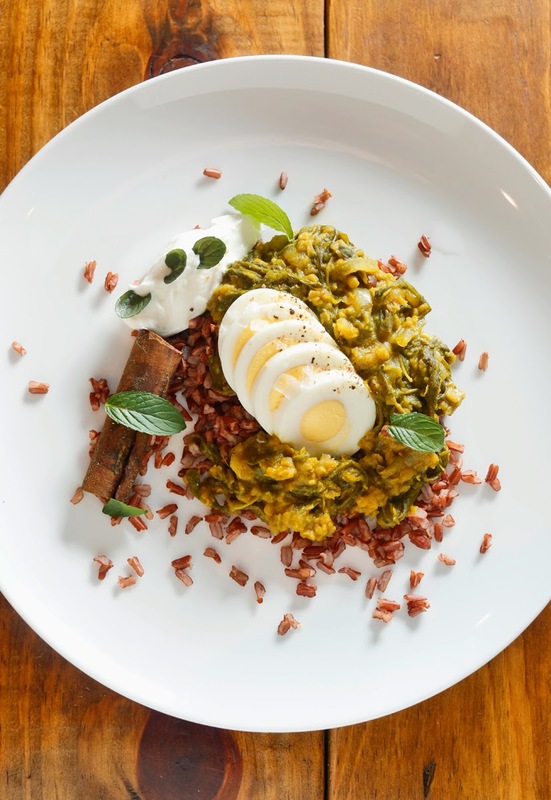 Simon Majumdar's dahl recipe can't be beat! We served it atop red rice with mint leaves and yogurt. For the story behind the dish, see the 5 Quick Questions post below. Make a paste by blending the ginger and garlic with a little salt and water. Finely mince the fresh chili. Put 2 tablespoons of oil into a hot pan, and when it comes to heat, add the cardamom, cloves, and cinnamon stick. Cook for 1 minute on a low heat until the spices release their flavor. Add the onion and cook on a low heat until it begins to soften and turn golden. Don't rush this as you want the natural sweetness of the onions to be released. Add the ginger/garlic paste and cook for 2 to 4 minutes until it loses its rawness. Add the minced chilies and cook for four minutes. Add the ground spices, sugar, and salt and mix well with the onions and cook out for 4 minutes until the spices lose their rawness. If the mixture begins to stick, add a little water. Add the lentils and mix well so all the pulses are covered with the mixture. Add 1 1/2 pints of water/stock and the lemons pieces.